A mermaid’s purse is a tough leathery pouch that protects a developing shark or skate embryo. This purse contains a baby catshark. Photo credit: Alice Wiegand. If you’ve ever been beachcombing you’ve probably wondered what those little black things washed up on the strand line are. Although frequently mistaken for seaweed, these tough little pouches are actually designed to protect baby sharks and rays! Although most sharks and rays give birth to live young or pups, some sharks and skates lay eggs which are surrounded by a tough protective casing. 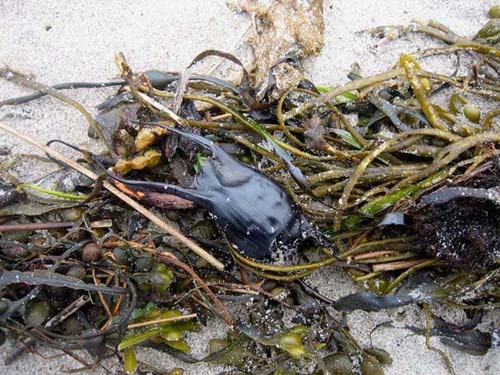 These eggcases can often be seen washed up on beaches and are sometimes referred to as mermaids’ purses. The purses are initially laid by the adult female in a suitable habitat on the seafloor, with the young embryo developing from the egg within the case for up to 15 months. The baby shark or skate then hatches out of the purse and swims away, leaving the discarded eggcase behind it. Sightings of mermaids’ purses on beaches and underwater can be used by marine biologists to map nursery areas for shark and ray species, some of which may be endangered or rare. If you have seen an eggcase, you could help to make a difference for vulnerable species by reporting your sighting to your local citizen science sightings scheme. Your sighting could help to gather crucial information necessary for fisheries conservation management. What does a mermaid’s purse look like? Mermaids’ purses can sometimes be mistaken for seaweed on the seashore as the small black or brown pods can look like the air bladder of some common brown seaweeds. However, on closer inspection you will see that the pod has distinctive spikes or curly tendrils at either end of the capsule. We can use the shape and size of these features to determine which fish species has laid the egg. A discarded Spotted Ray (Raja montagui) eggcase on a beach in the west of Ireland. Photo credit: Sarah Varian / Marine Dimensions. Square or rectangular purses with spikes at either end are generally laid by skates and rays. These horns help to anchor the purse to the soft sediment of the seafloor, which may be sand, mud or gravel, depending on the fish’s nursery habitat preference. Tubular eggcases with curly tendrils at either end are usually laid by catshark species. The female uses these strings to attach the purse to seaweed in the shark nursery area. A Lesser Spotted Dogfish purse (Scyliorhinus canicula), a common species of catshark found in the Northeast Atlantic and Mediterranean Sea. Photo credit: Sarah Varian / Marine Dimensions. Many aquariums display shark and ray nurseries with mermaids’ purses containing live embryos. Check out our video of Lesser Spotted Dogfish (also known as Small Spotted Catshark) embryos in Galway Atlantaquaria in Ireland. You can see the babies wiggling their tails to replenish the oxygen in their purses. How long do the shark and skate embryos stay in the mermaid’s purse for? The embryo develops from the egg in its purse obtaining nourishment from the yolk sac as it develops. The time spent in the egg by the embryo depends on the species. Some, like the rare and critically endangered White Skate, may stay in the pod for as long as 15 months! Other species may be ready to hatch after a few months. All species remain in the purse until the baby is ready to live life independently in the ocean without any care from its parents. How does the baby shark or ray hatch out of the purse? When the baby shark or ray is hatching, it squeezes out of the top of the eggcase through a narrow slit between the horns or tendrils. This opening may be difficult to see if you find the purse on the seashore when it has already dried out. There may also be holes in the side of the capsule from wear and tear or from predators scavenging on the shoreline. If you would like to view the hatchling slit, try soaking the eggcase in water for a couple of hours so that it becomes soft and pliable. Then squeeze the sides of the purse gently with your thumb and forefinger and you will see the purse exit opening at one end. Where is the best place to find a mermaid’s purse? Mermaids’ purses are frequently washed up on beaches by the surf and rising tide, and you can often find them tangled up in seaweed on the strand line. The smaller eggcases are also frequently blown by the wind and deposited right at the back of the beach, sometimes even as far as the sand dunes. So if you’re searching a beach for shark, skate and ray eggcases, try to focus your efforts on the space in and around the high tide mark, as this area will most likely yield the best results! What should I do if I find a mermaid’s purse on the beach? Will the baby still be alive inside the purse? If you are beachcombing after a particularly bad storm, it might be possible for you to come across a mermaid’s purse that still has a living embryo inside it. However, this is very unusual. Only embryos with eggs in sealed eggcases, generally in the early stages of development, are able to survive on the shoreline in their purses which contain all the nutrients they need. After some time developing in the eggcase, most shark and skate embryos rely on flushing oxygen-rich seawater into the purse with their tails or wings through slits in the case. Without this oxygen, they die. This is why the baby sharks can be seen wiggling their tails! Most of the time you’ll find empty purses that have been discarded by fish that have already hatched and are now living life as young fish in the sea. 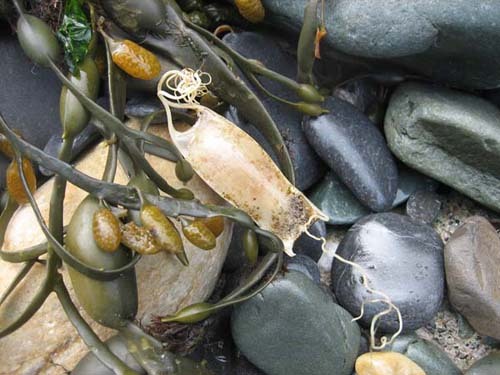 You may also come across eggcases which contain dead embryos which have most likely died due to lack of oxygen as a result of being stranded on the beach. Check out this video of a catshark embryo which was found on the seashore in Ireland by two of our work placement students after a particularly bad storm! 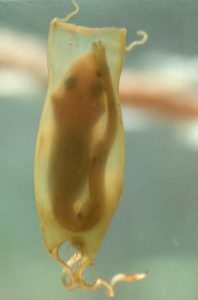 If you have found a live catshark embryo, you will most likely see the fish moving inside the eggcase as the capsule wall is translucent. You’ll be able to see through the purse. It’s more difficult to see the skate and ray embryos in their purses as the eggcase walls are thicker and more opaque. You may need to hold the purse up to the light to see whether there is something inside. If the shark or ray is dead it is less likely that you’ll be able to see it clearly as the fish will probably have already started decomposing. If you think the baby shark or ray may still be alive in its purse, carefully place it back in the sea in an area that is away from the surf and below the shoreline or tidal zone if possible. Remember to stay safe and follow the Seashore Code at all times when you are beachcombing. If you are sure that there is no live embryo in the eggcase and you would like to preserve it, the first thing you need to do is make sure that the purse is clean and dry. To dry the purse you should put it somewhere warm, eg. on a sunny window sill. Once dry, you can then store the eggcase in a container or a reusable plastic bag. The eggcase is made of collagen, a tough and durable protein which will not decompose for many years if stored in a dry environment. If you’re storing the specimen with a view to passing it on to a marine biologist, be sure to label the sample with the date and the location of your sighting. Some of the schools that we visit on our seashore safaris also like to display the eggcases on their nature table. If you’re feeling creative mermaids’ purses make great necklace pendants too! Are Great White Sharks born alive or from eggs? About 40% of shark species lay eggs on the seafloor with a protective mermaid’s purse. Other shark species give birth to live pups, which is unusual for fish in general as it is generally the mammals in the animal kingdom which produce live young. Great White Shark embryos hatch from an egg inside their mother, feeding on unfertilised eggs in the womb until it is time to give birth. The baby sharks are then born as independent pups, ready to live life without any care from their parents. Female Great Whites are believed to be pregnant for a year or more, giving birth to 2 to 12 pups every two or three years. What is the difference between a skate and a ray? The term ray is used in a fairly loose way to describe skates and true rays. A true ray is a ray that gives birth to live pups, whereas a skate is a ray that lays eggs or mermaids’ purses on the seafloor. So technically, a skate can be a ray and a ray can be a skate. For example, a Thornback Ray (Raja clavata) is a type of egglaying skate, while the rare and critically endangered Flapper Skate may also be referred to as a ray. This is a question that we get asked a lot when we’re reaching out at education events and it’s difficult not to give a confusing answer! To make this article more readable we have linked through to sources of information in the text. Learn more and be part of our community! We get a buzz from connecting people from around the world with our fascinating marine world, especially when it comes to Ireland’s rich natural heritage! Why not join our community and sign up to our mailing list? We would love to keep you posted and you can of course unsubscribe at any time.